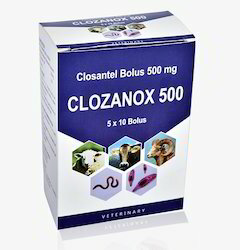 Closantel is a broad-spectrum salicylanilide anthelmintic which is active against Fasciola hipatica, F.Gigantica, gastrointestinal nematodes and young arthropod. Sheep and Goats: 5-15 mg closantel per kg bodyweight. Calves and Cattle: 5-10 mg closantel per kg bodyweight. Gastrointestinal worms : Bunostomum, Cooperia, Chabertia, Haemonchus, Nematodirus, Oesophagostomum, Ostertagia, Strongyloides and Trichostrongylus spp. Calves and cattle: 1 bolus per 60 kg body weight. For liver fluke: 1 bolus per 35 kg body weight. Sheep and goats: 1 bolus per 35 kg body weight. 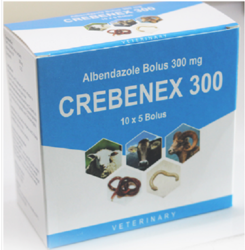 For liver fluke: 1 bolus per 30 kg body weight. PACKING 10 Blisters containing 5 Boli each, are packed in a carton along with the Pack Insert. 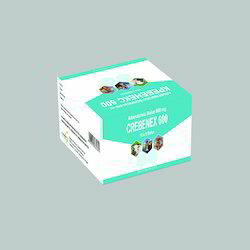 Packaging Size 10 Blister containing 10 bolus. Dogs and Cats : Taenia spp., Dipylidium caninum, Echinococcus granulosus (tentatively). 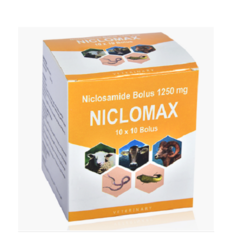 Sheep and Goats : 75 – 80 mg of Niclosamide per kg Bodyweight or one bolus for 15 kg Bodyweight. PACKING : 10 Blister containing 10 bolus. 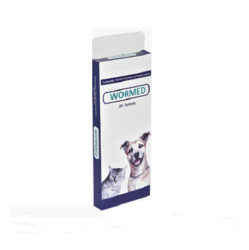 WORMED (praziquantel/pyrantel pamoate/febantel) broad spectrum anthelmintic tablets are indicated for removal of tapeworms (Dipylidium caninum, Taenia pisiformis, Echinococcus granulosus and for removal and control of Echinococcus multilocularis), for removal of hookworms (Ancylostoma caninum,Uncinaria stenocephala), roundworms (Toxocara canis, Toxascaris leonina), and whipworms (Trichuris vulpis) in dogs. 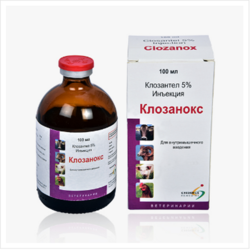 Treatment and prevention of several infections caused by parasites sensitive for closantel like Fasciola hepatica, Fasciola gigantica, Haemonchus concortus , Haemonchus placei, Bunostomum Phlebotomum, Oesophagostomum radiatum and Strongyloides papillosus in cattle and sheep. In Sheep : Treatment and prevention of infections caused by parasites sensitive for closantel like Paramphistomum spp, Chabertia ovina and Oestrus ovis. For liver fluke : 1 bolus per 35 kg body weight. For meat : 77 days. Propylaxis and treatment of worm infections in calves, cattle, goats, and sheep-like gastrointestinal worms, lung worms, tape worm.